I would like now to share with you my Coast to Coast experience. The night before the start of the big ride I packed all of my cycling clothes, spare inner tubes, power bars etc into a Camelbak back pack, this was quite good for me as i never travel light. 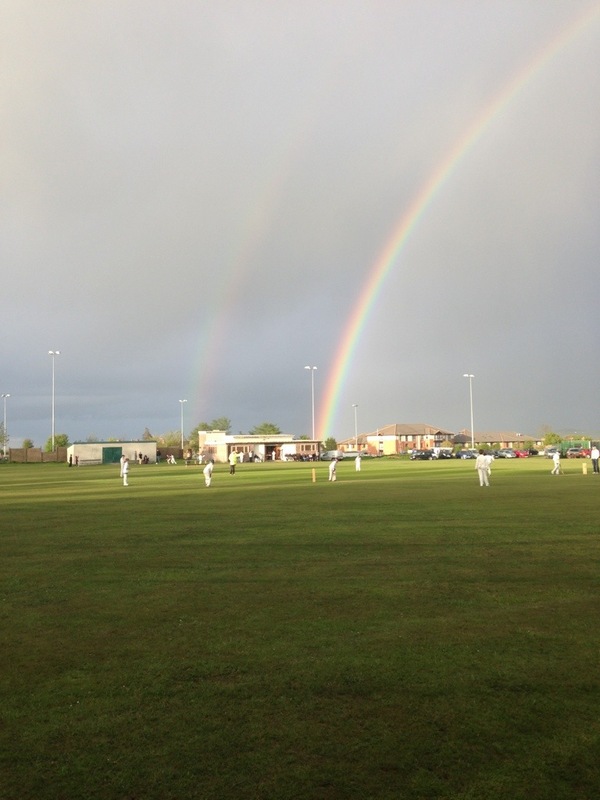 I took my youngest son and my daughter to their cricket game and little Reuben sent me a present of a double rainbow (which I am sure was for myself and my brother who were to undertake the biggest physical challenge of our lives), I believe Reuben sends rainbows to tell people everything will be alright, below is the picture of that beautiful double rainbow. 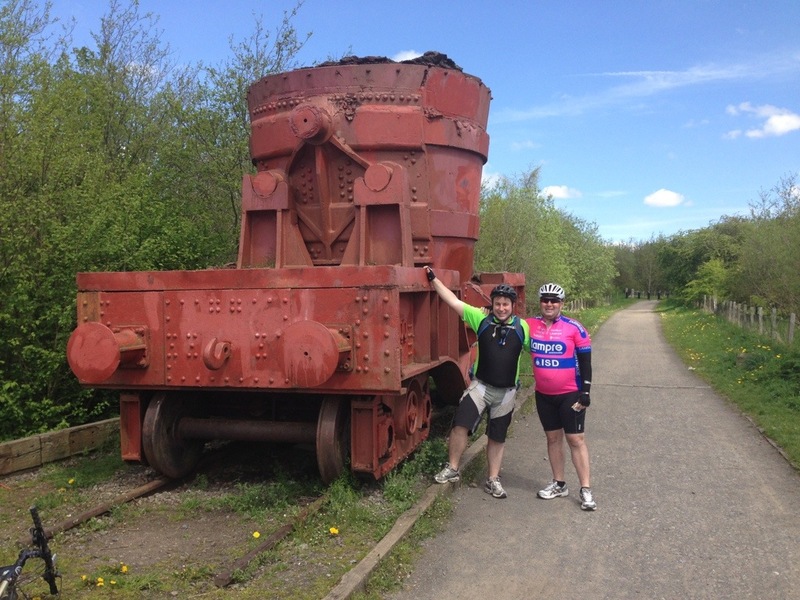 We loaded our bikes onto the bike rack and my wife Carolyn drove us to Carlisle so we could catch the train to Whitehaven and the start of our journey. The train from Carlisle takes just over an hour but beware only 2 bikes are allowed on each train and this can not be pre-booked. 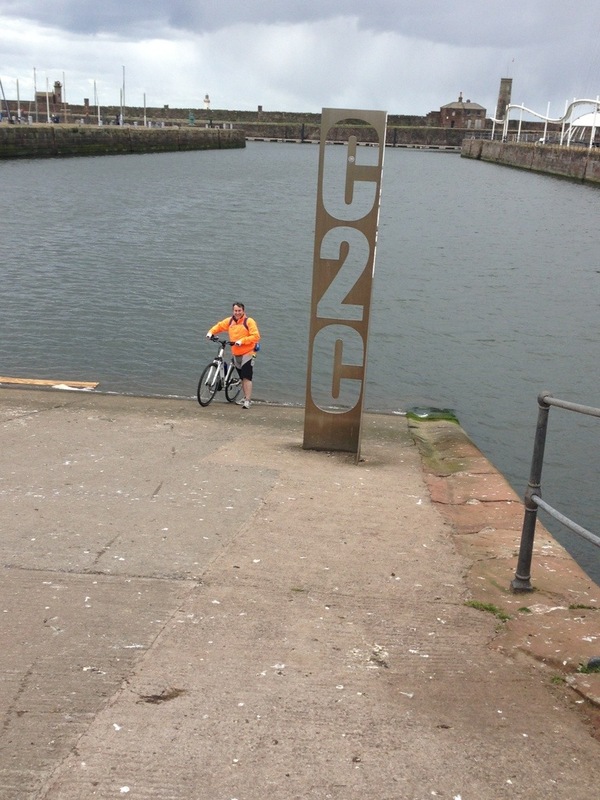 We arrived in Whitehaven and after some negotiating found the start line in the marina where the tradition is to dip your back wheel in the Irish Sea as the picture below shows me doing. It was time to depart and the weather unfortunately closed in and it started to rain but at least the wind was behind us. When you leave Whitehaven you have a gradual ascent for 10 miles on old railway tracks, before our first serious climb, you see all these large hills in the distance and you keep thinking surely we won’t be climbing them, oh yes we did ! Below is a picture of the back pack that I had 3 days clothes in as well as a pic of the hills we had to climb on day one. When we got to the top little Reuben was mischievous and give us not one but two hail storms to battle through and we were soaked before the beautiful descent into Loweswater and out first opportunity to have a break at the Kirkstile Inn where warm soup and tea in front of a real fire helped warm us through. 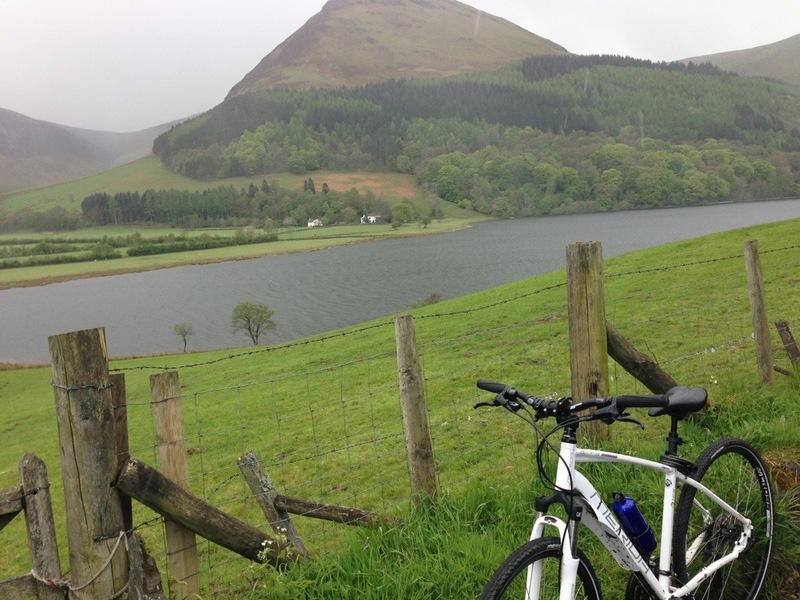 A picture below of beautiful Loweswater. After a long day in the saddle we still had the challenge of climbing up Whinlatter Pass and through the forest before a big descent (my favourite part of the day) into Braithswaite and on to Keswick where we stayed at the YHA for the evening. 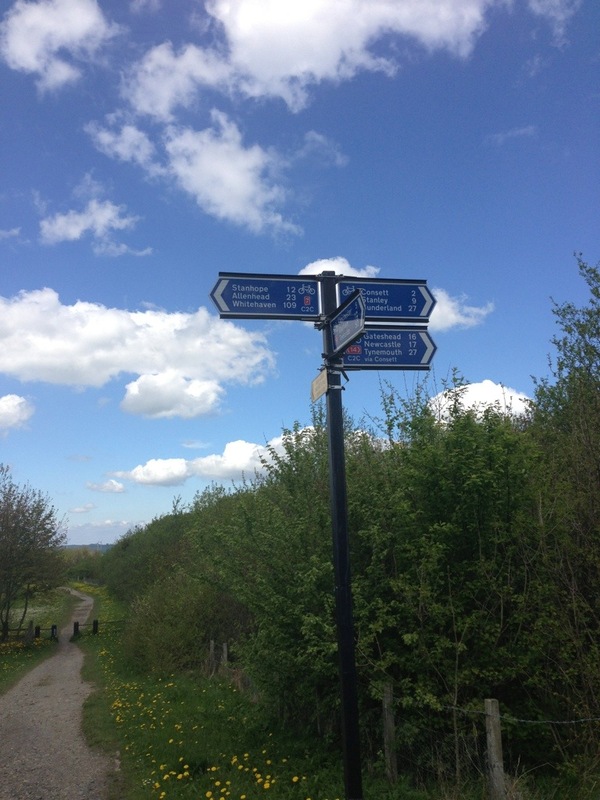 Advice to anybody doing the c2c Whinlatter is not easy and only suitable to people who have trained hard (unlike us) a more gentle start from Workington is a better option if its more of a holiday than a challenge. I wasn’t having much luck on day 1 and I did end up with a puncture before Whinlatter so a quick inner tube change was needed. 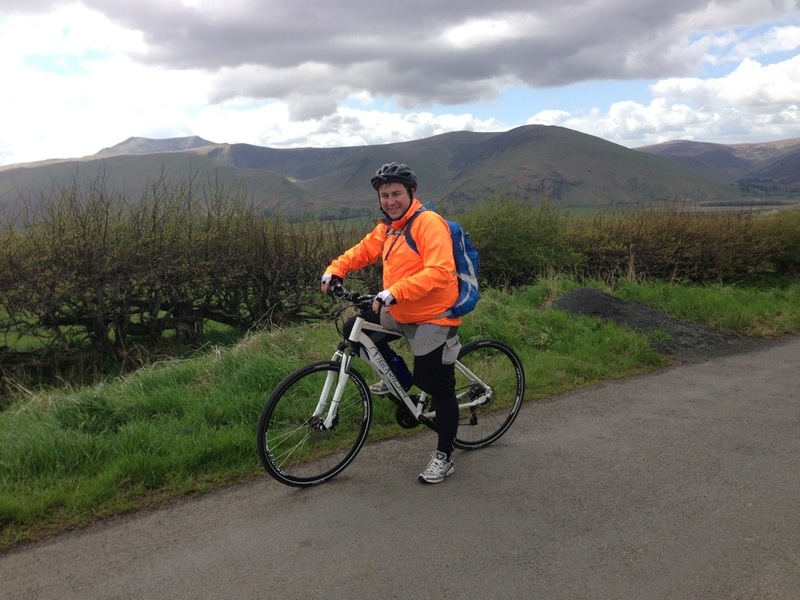 Arriving in Keswick was a relief as there was a lot of uphill climbing and after 30 odd miles it does hurt. Day 2 was the most difficult day and we did have to change our plans as we were a little over ambitious when booking a hotel in Nenthead (55 miles from our start point). The weather was what can only be described as awful. We had strong headwinds into our faces and heavy rain, this is the type of weather that slows you down and can break your spirit, after 2 hours we were only 10 miles into our journey, I started to worry and think of alternative stops, luckily the guide I had gave ideas for accommodation and I managed to get accommodation at the Bank House Farm in a static caravan which included a farmhouse breakfast, this was right on the route and lifted us knowing we would reach our destination. 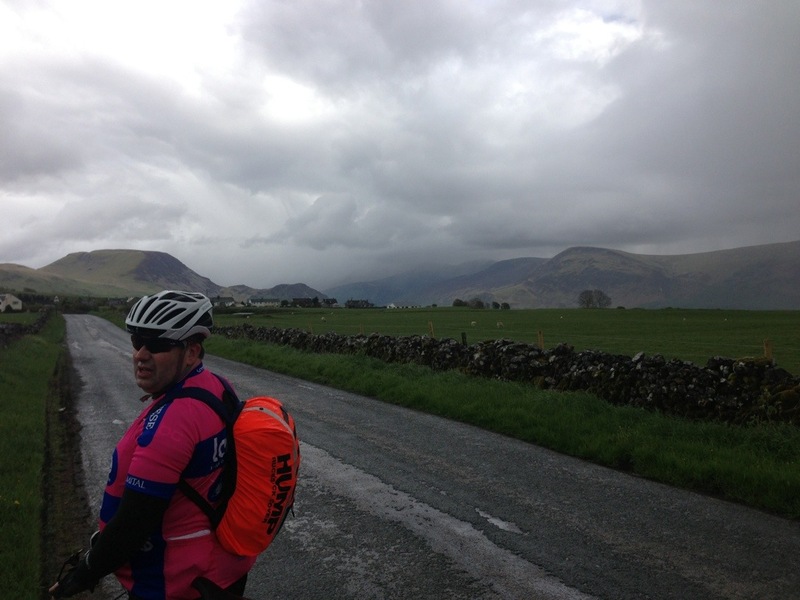 The ride out of Keswick is beautiful but the wind made the whole day a slog. We took an alternative route to Greystoke that involved a lot of climbing but unfortunately we missed our turn and ended up adding approx 5 miles to our day. Below is a picture of the journey out of Keswick before the rain got very heavy. 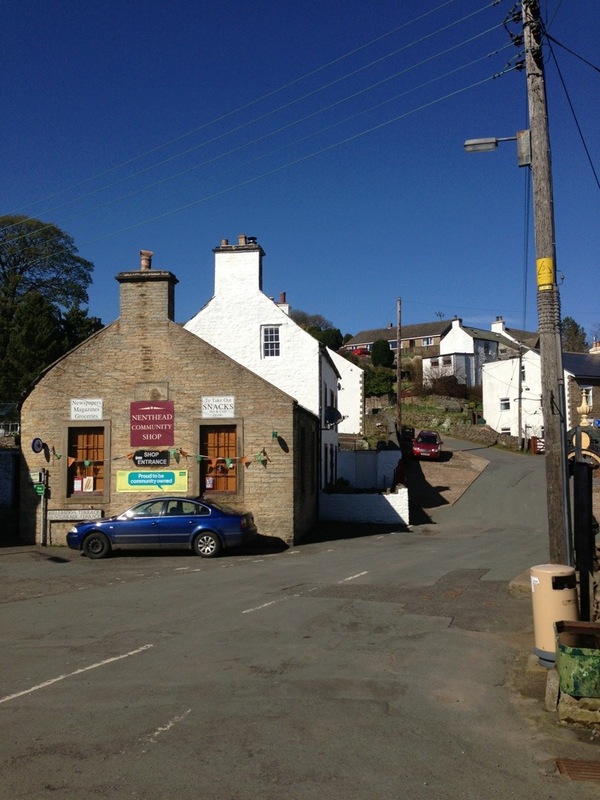 After a climb out of Penrith our destination was close and just another 6 miles to our beds for the evening. 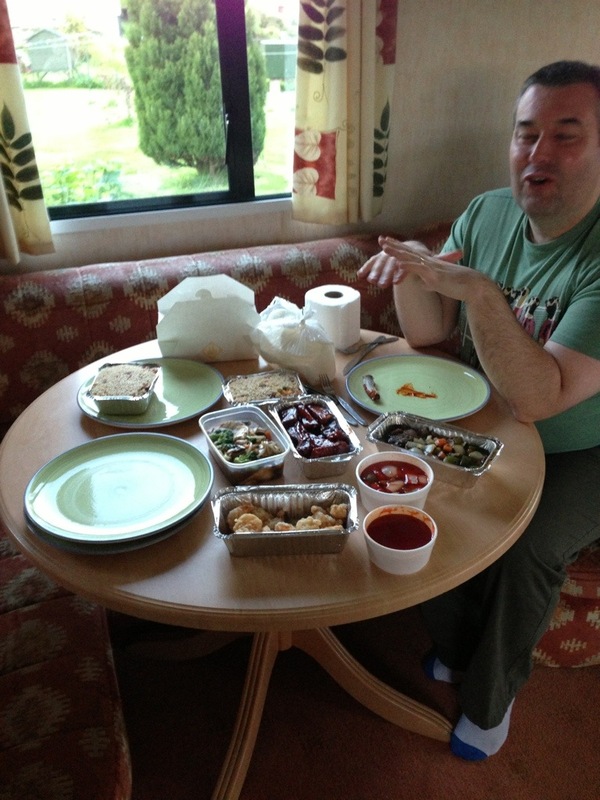 we ordered a Chinese takeaway for 3 (between 2 of us and yes we did eat it and no I don’t feel guilty). Below is a picture from the top of the hills before we missed our turn looking for Greystoke and our Chinese meal ! So after 30 odd miles of slogging in bad weather I was hoping Reuben would be kind with weather on day 3, the thought then struck me, it had to be a challenge as a lot of people have worked hard on their challenges so why should I get it easy. What a difference a day makes, we woke up to beautiful sunshine on the day that promised the biggest climbs as we left the Lake District behind us. 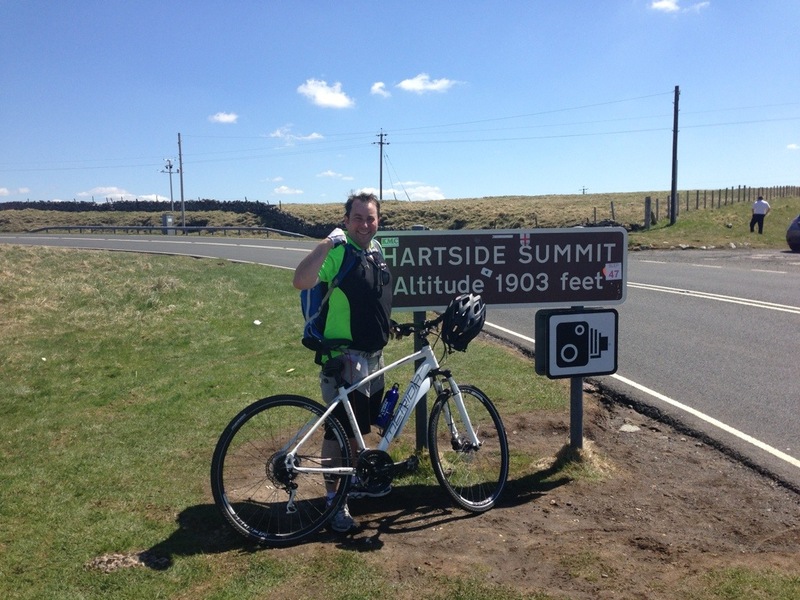 I had to climb my personal nemesis Hartside Pass which is a 4 mile Climb up to 1900 ft above sea level. Hartside is popular with motorcyclists and in my mind i wanted to climb Hartside and I had my euphoria moment when I did it. I put on my my headphones and turned into the little engine that could. 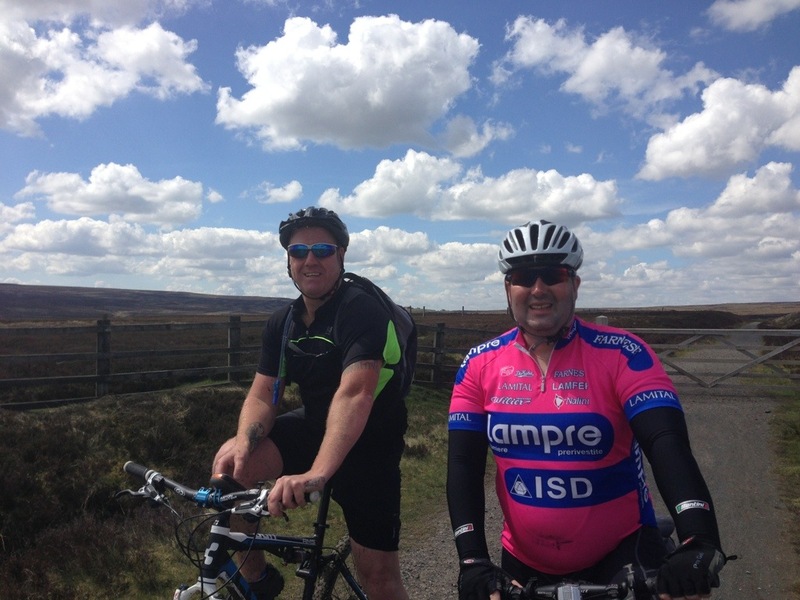 Below are some pictures of Hartside and me at the top (some from a distance some from the climb). After a stop for a Flapjack (that my brother Stephen says has healing powers) and a mug of tea we descended around 700 feet in what felt like 5 mins before heading into the most deserted part of the trip to Garrigill, on leaving Garrigill we found the hill out of the town which wasn’t really on the map as a climb was a leg sapping experience which I have to be honest I pushed my bike up most of it, this was a two mile hill with false horizons that only the fittest and experienced cyclist could conquer. 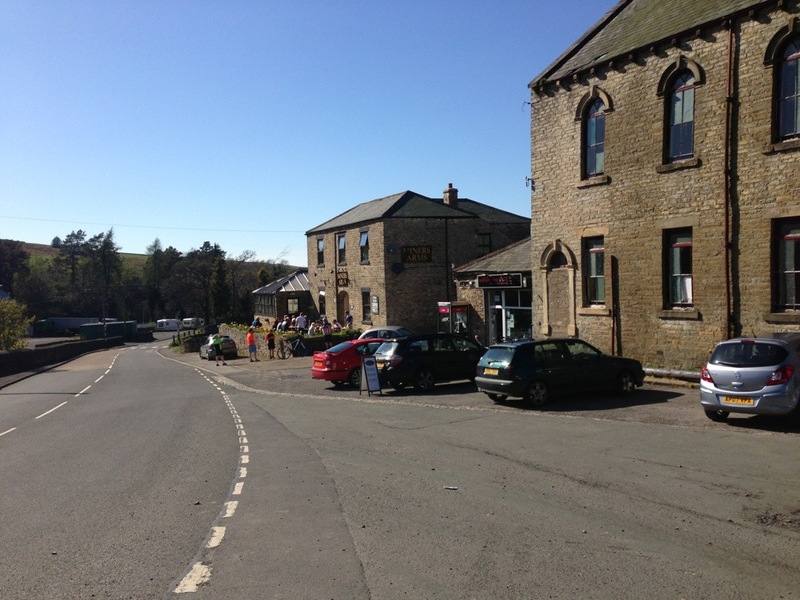 Time was getting on and as a keen football fan we decided to take the direct route to Stanhope so we could watch the Champions League Final. 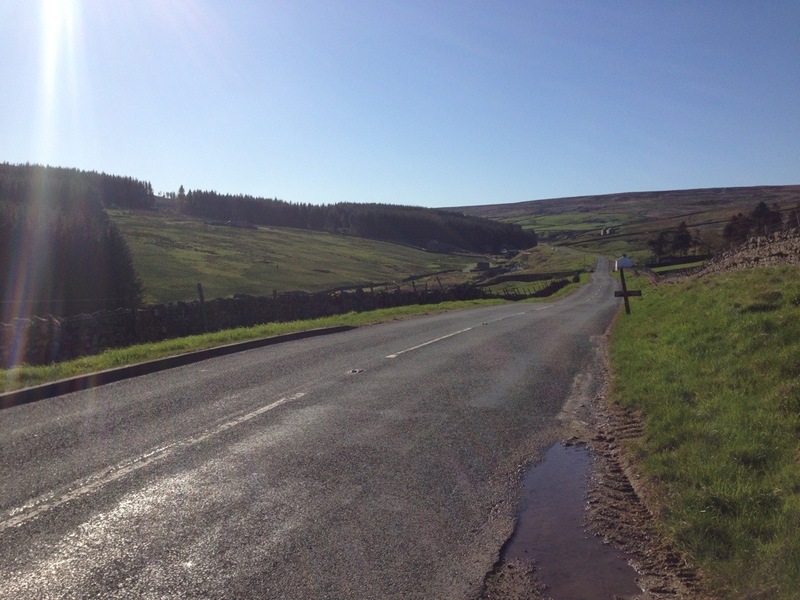 This involved a big climb out of Nenthead and then a 13 mile sweep through the dales, this sound amazing until you take into consideration Saddle Soreness ! 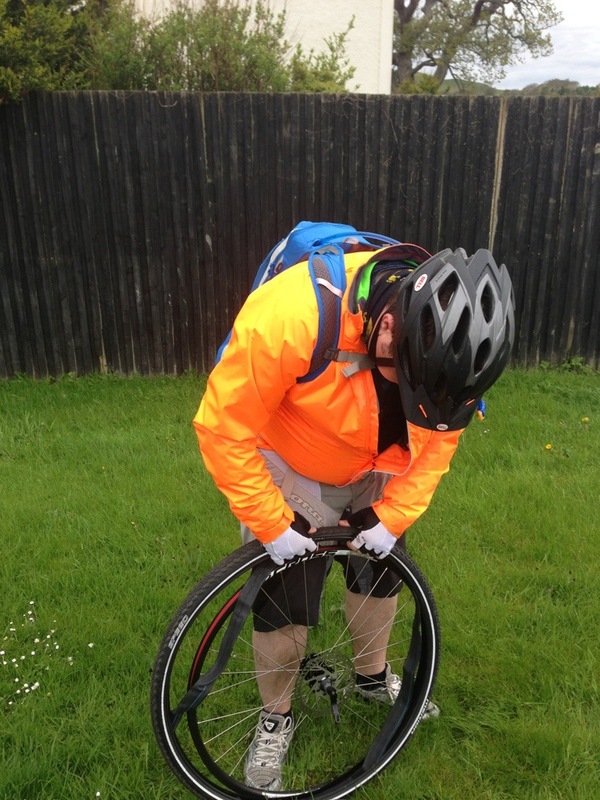 I felt every pothole and had to stop every 4 or 5 miles as it hurt like I don’t know what. 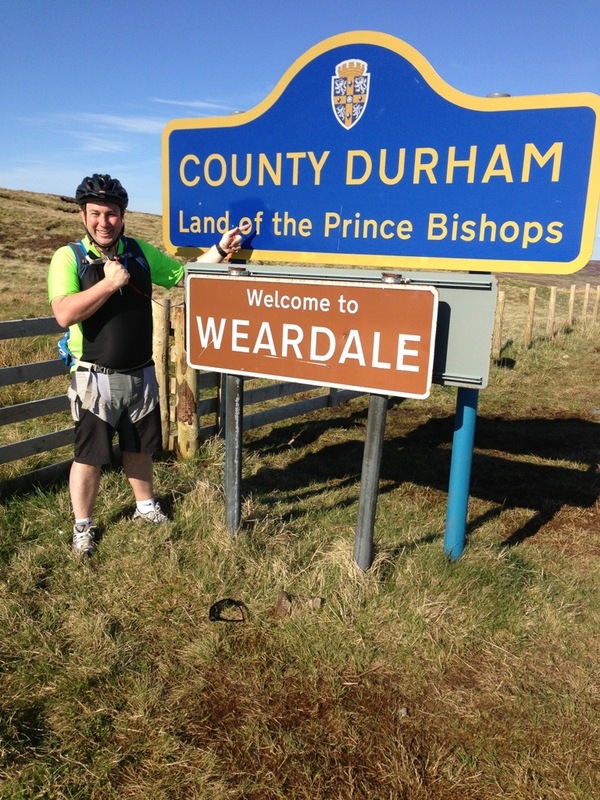 County Durham is my home county and I was relieved to see the sign meaning that the main climbs were behind us. After 40 odd miles and a beautiful Whale of a Cod and Chips it was time for bed knowing that the next day would be the day we would complete our challenge. We both woke up very sunburnt as we were silly and did not pack suntan lotion, luckily we were joining Glyn a friend for the last day and after a text his wife Janine brought us factor 50 to stop severe sunburn turning into 3rd degree burns (quick tip a small sachet of suntan lotion only takes up the same space as a power bar so make sure you take some). 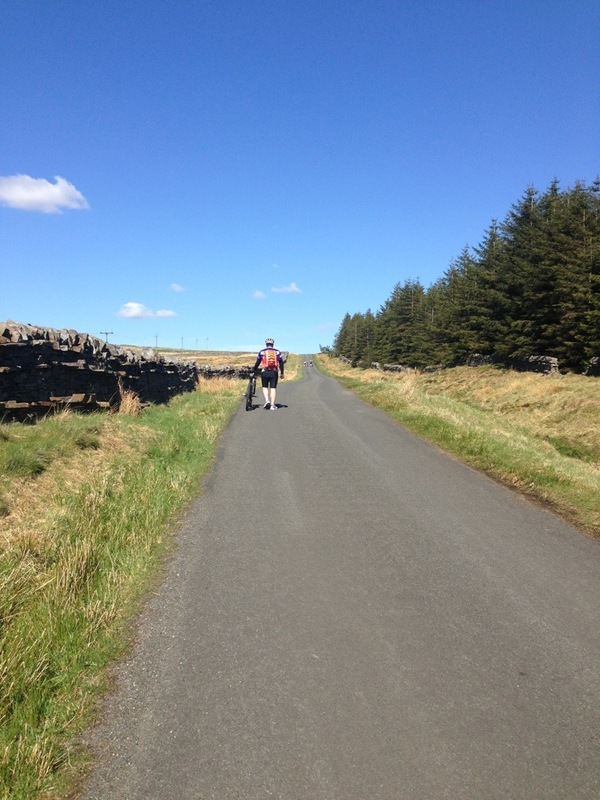 Our legs were very tired and the last day is a gradual descent into Sunderland with only one problem ‘Crawleyside Bank’ which I now know is a 2.8 mile climb and not very pleasant especially when your calf muscles are tight. 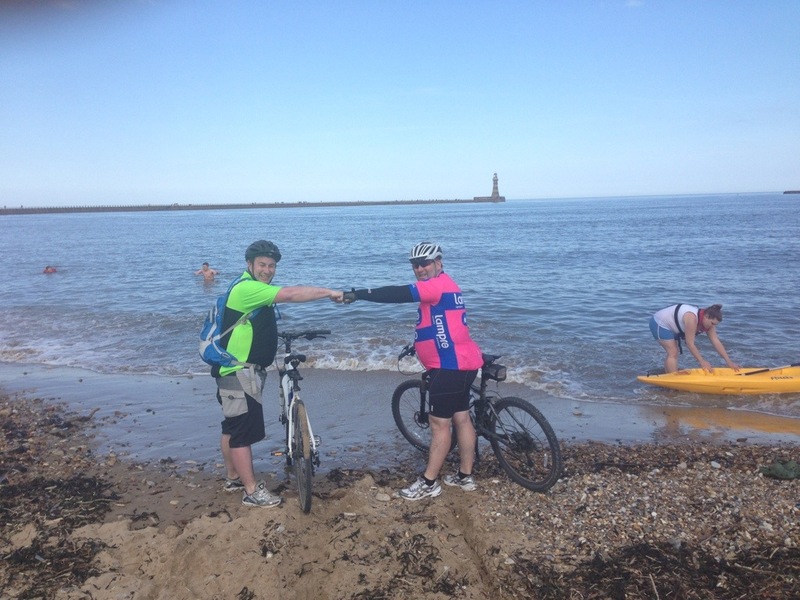 Never mind that was in the past and we got there making sure that we did the whole journey from Whitehaven to Sunderland using our legs only. 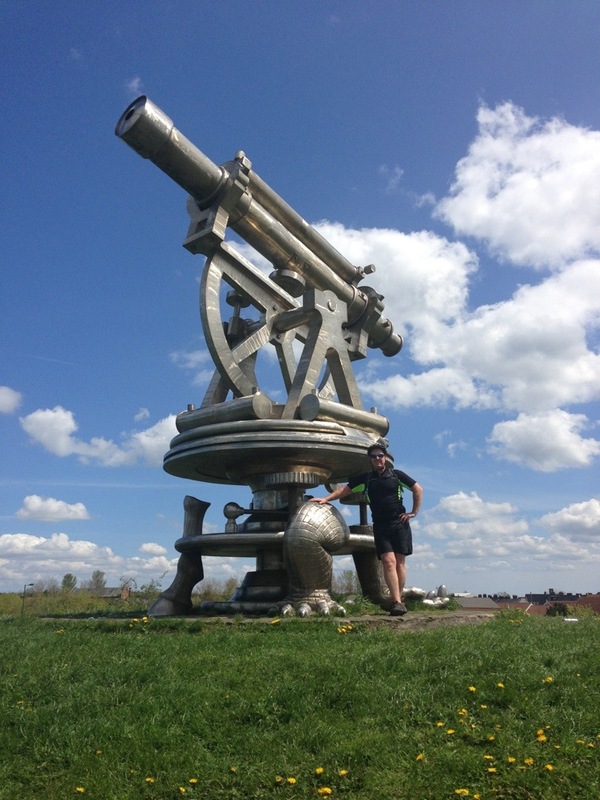 After meeting Glyn half way up Crawleyside and a brief stop at the cafe my favourite part of the trip was about to start and Waskerley Way did not disappoint a beautiful downhill section to Consett on old railway lines. Consett is as I’m sure a lot of people know famous for its heavy industry and Steel Works that closed years ago and is a town totally regenerated. It is also the point you decide if you are going to end in Sunderland or on Tyneside, we chose the Sunderland route as it is the original c2c route. 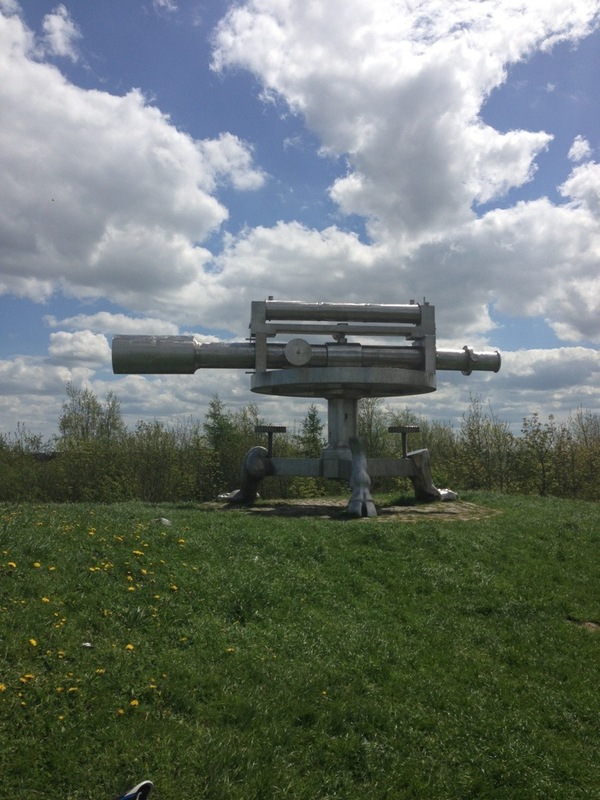 I have a few pictures below of the artwork that you see in and around Consett, I was a bit upset to see vandalism on some of the statues and I sincerely hope that the people who did this grow up and stop. Below are some marvellous statues on route. 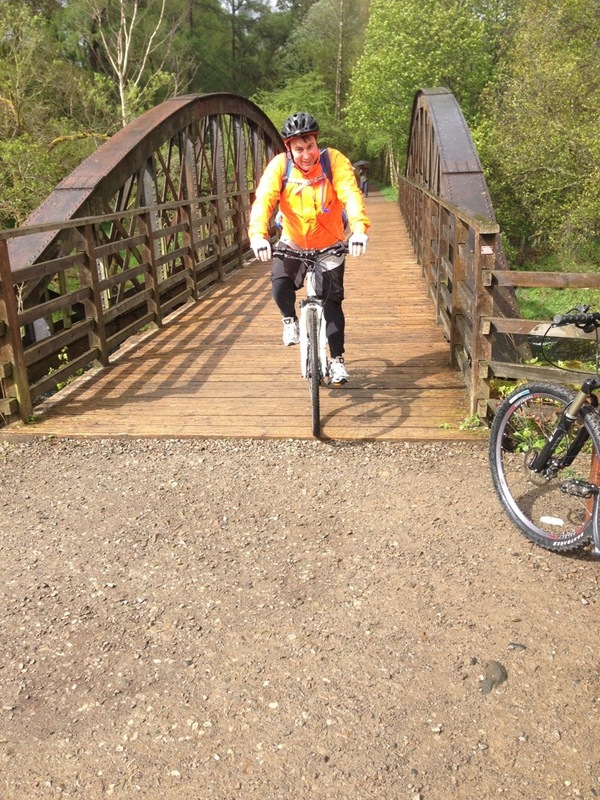 Once we navigated Consett we had a lovely downhill section past Beamish, Stanley and Chester-Le-Steet to Washington. This was where my Saddle Sore Bum really hurt but it was a godsend that Glyn joined us as his enthusiasm helped drag us along and put a smile on our faces. 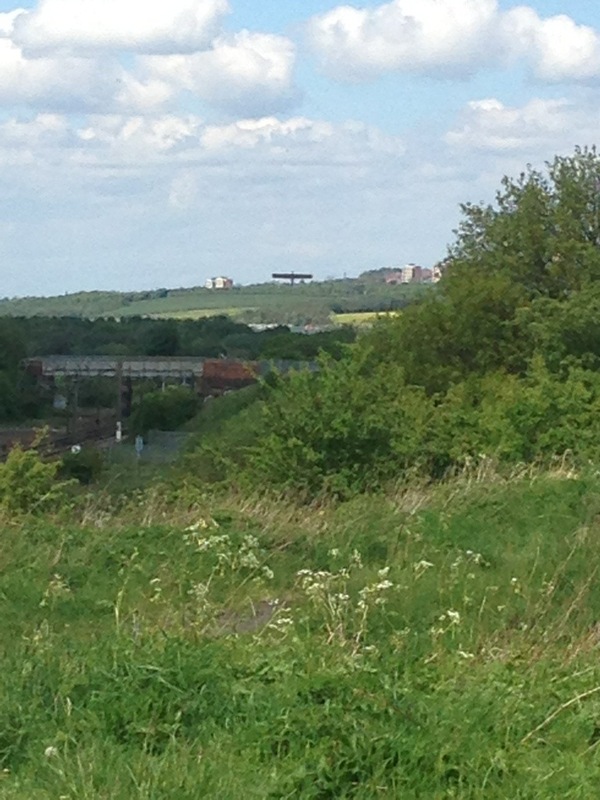 Washington is just outside of Sunderland meaning that we were within 10 miles of finishing and from here I took pictures of two of the North East’s iconic landmarks ‘the Angel of the North’ and ‘Penshaw Monument’. 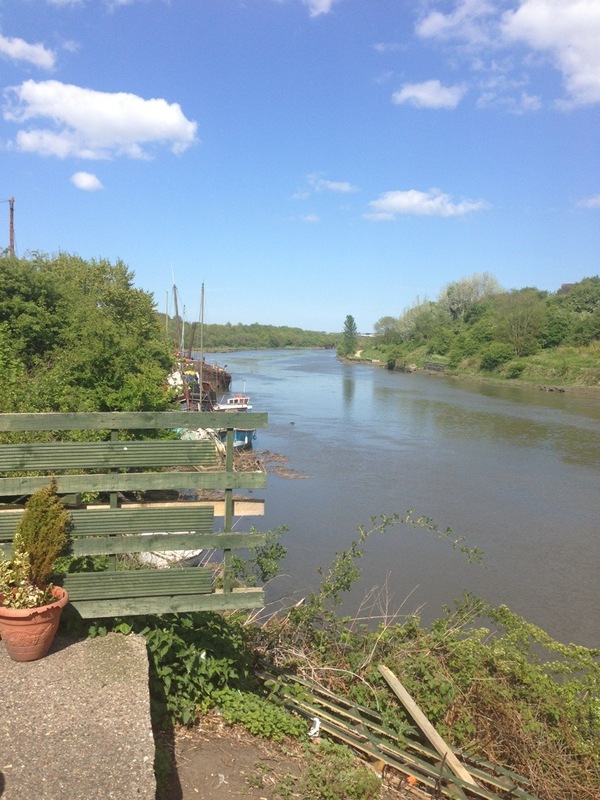 Soon we had gone under the a19 and stopped approx 7 miles from the finish line for a snack and an orange and water by the River Wear we were ready for the dash to the North Sea. After some tricky paths and an avoidable accident by myself (I managed to go over the handlebars when I forgot i wasn’t on a mountain bike, only my pride was hurt). 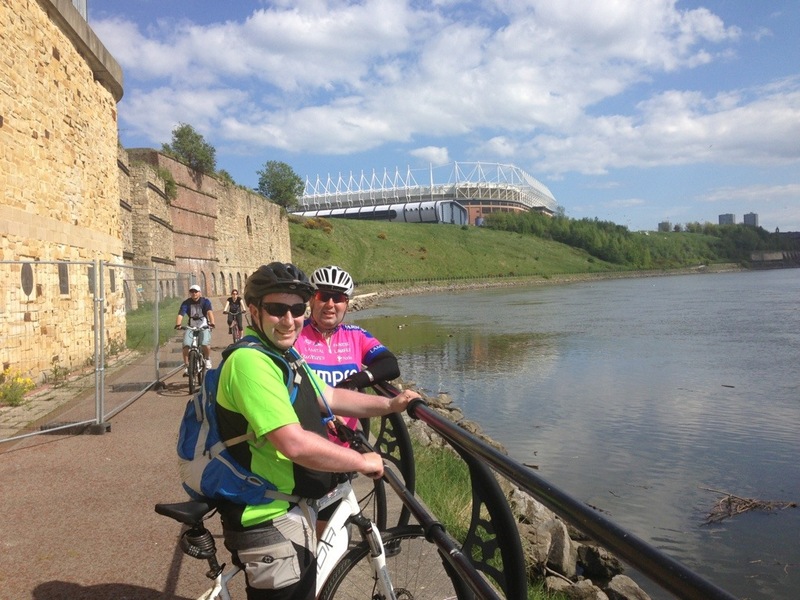 We soon passed the Stadium of Light which two out of three of us enjoyed ! The finish is a lovely regenerated path by the river where you pass the university and head to the finish line at Roker. I put my favourite training song on my iPhone ‘Titanium’ and drove my bike into the North Sea. 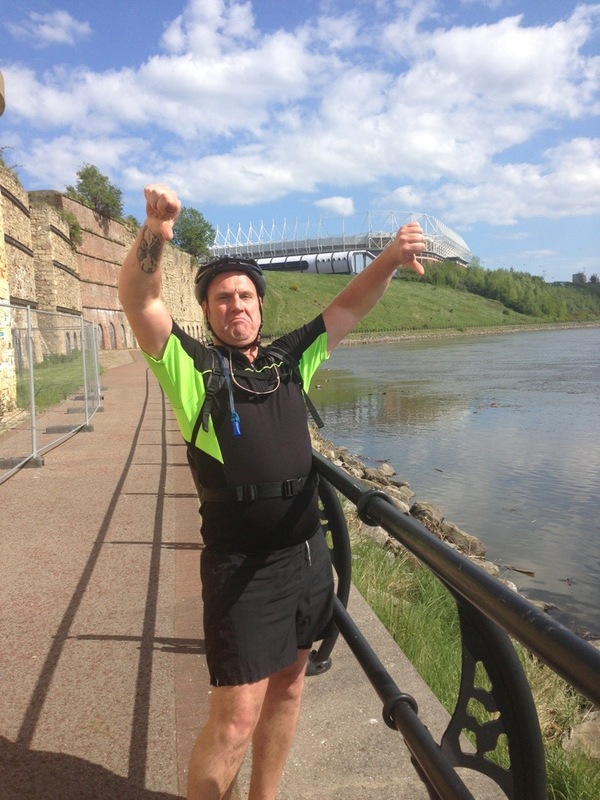 I was very relieved and sore when I finished and with a great satisfaction that once my cash pledges come in I will reach my target of over £1000 for Reuben’s Retreat. 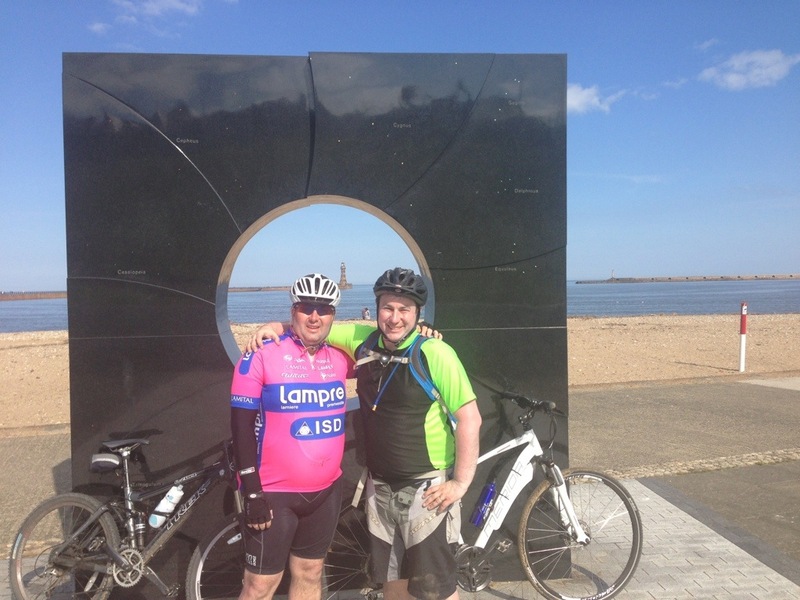 The last day was a 40 mile ride meaning we biked just over 140 miles when you take into consideration our detours. 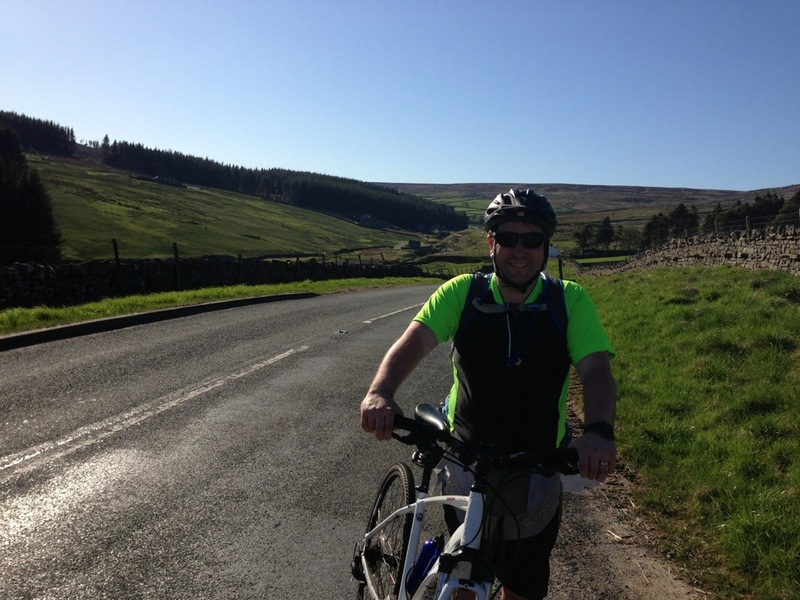 1) Train Hard – we didn’t and that wasn’t big or clever, I have only been on my bike 3 times in 2013 before the c2c and the longest ride was 18 miles. 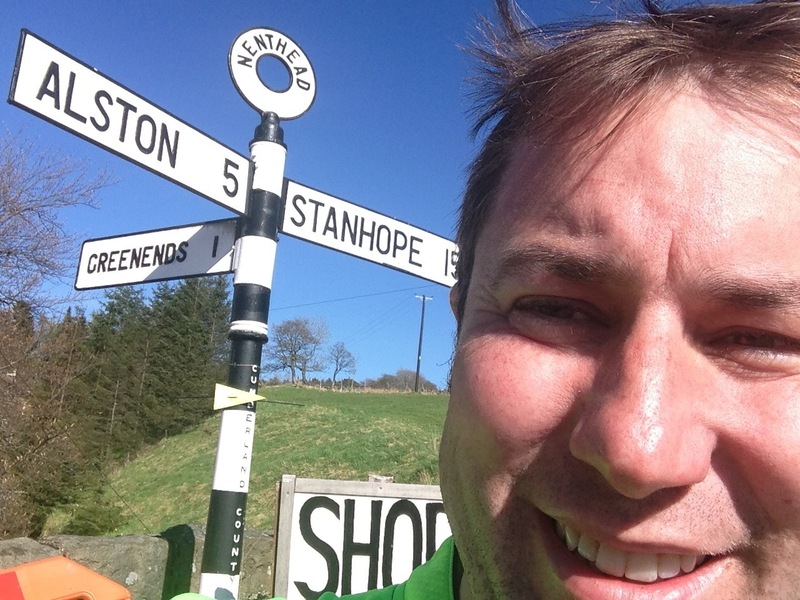 2) Do not overestimate how many miles an hour you will do, there are a lot of hills and you will be in the saddle for approx 6 hours a day, you may average 10 miles an hour on your favourite local route but this is unlikely going through the Lake District or the Pennines. 3) Use the right type of bike. I used a hybrid which is tough enough for offroad but has bigger wheels and thinner wheels than a mountain bike. 4) Pack Lightly. 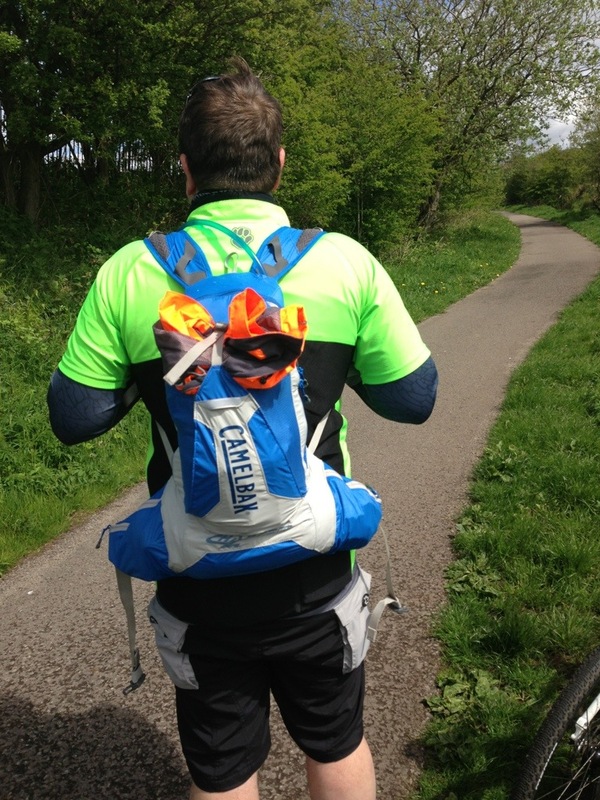 We did the c2c unassisted so it was essential to travel light and I used a Camelbak Charge back pack that you could put in 2 litres of water as well as clothes, power bars and toiletries if you packed carefully. 6) Take a map and a guide book, I recommend a book called the Ultimate c2c guide by Richard Peace. 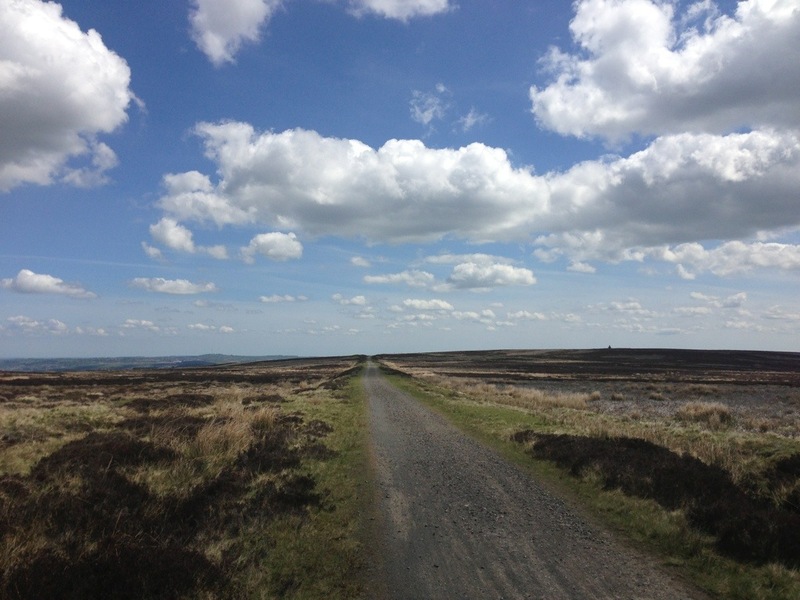 7) Work out where you are staying and book in advance and please do not be over ambitious with your mileage, fit cyclists can make Penrith on Day 1, Rookhope / Eastgate or Stanhope on Day 2 and finish on Day 3. The rest of us should consider 4 days to enjoy the beautiful views. 8) Eat plenty, drink water regularly and make sure your body is fuelled, you will burn approx 300 calories an hour and if you let your reserves dip too low you will find it difficult to build it back up and be effective on your bike. 9) Talk to the locals and fellow cyclists they give good advice and it adds to the fun of the journey. Remember, you can have the equipment of Bradley Wiggins but if you have not trained hard enough power bars and caffeine gels won’t miraculously get you through the mountains, grit and determination will. My mate Phil advised me when climbing hills look at the Tarmac and not the hill and take your time, it worked for me, thanks Phil. For those who would like a great bargain on Royal Caribbean then I am delighted to announce a 4 Day Wow Sale starts at 9am Saturday. Enjoy up to $200 Free On Board Spending Money* and amazing prices. plus prices on 12 night cruises on Brilliance of the Seas sailing from Harwich from £629. 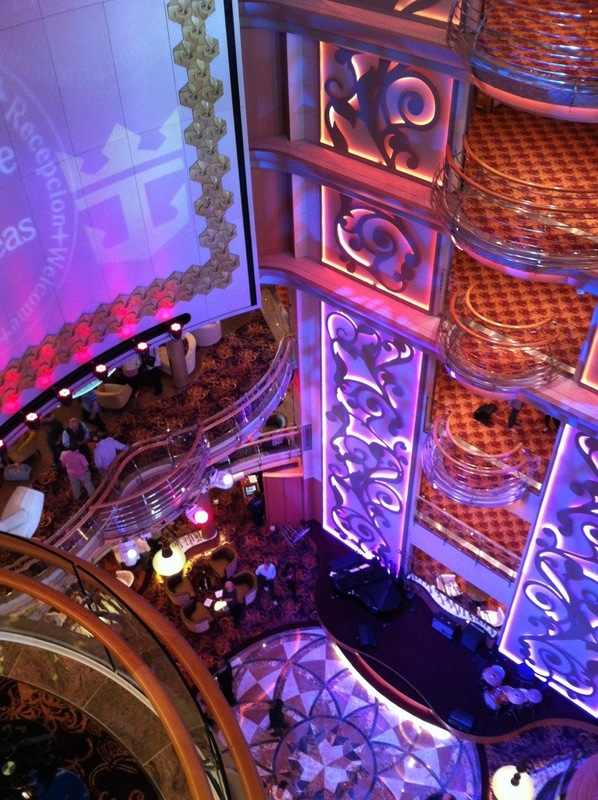 One of the biggest changes in Brilliance of the Seas is the additional dining. Royal Caribbean have always offered choice on board their ships when dining but with a few additions and great cruise can become a Wow cruise. I will discuss the usual dining options below but I wanted to highlight the fabulous additions to Brilliance of the Seas. First of all there is an additional of a Mexican Speciality casual restaurant ‘Rita’s Cantina’ which offers oversized taco shells with fresh fillings, fajitas and other Mexican specials and the best news is its complimentary ! Drinks can be purchased to enjoy with your meal so why not enjoy a margarita or grab a cold bottle of Carona to enjoy with your Mexican food. I was very impressed with the choice of speciality dining on board Brilliance of the seas and even more impressed at the special packages offered. 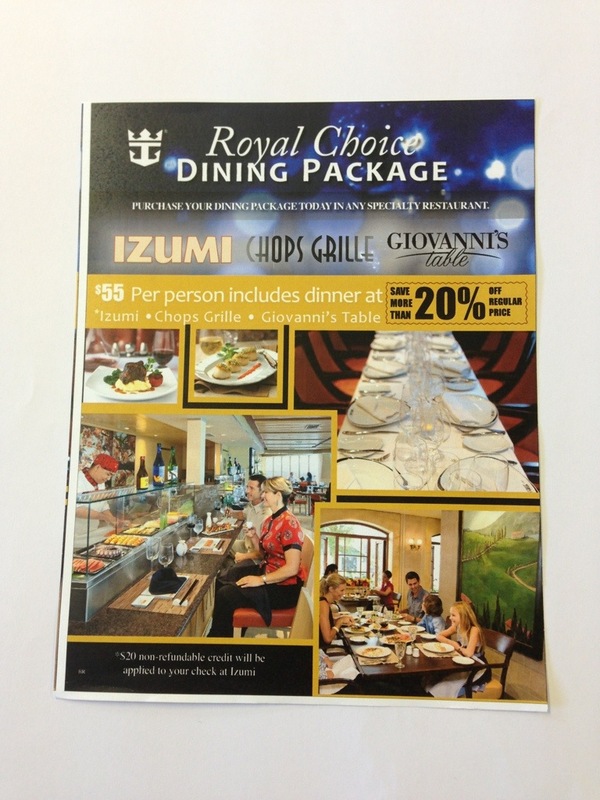 There were 2 packages offered the ‘Royal Choice’ which allowed you to dine once in Chops Grille (fine steak restaurant), Giovanni’s Kitchen (family style Tuscan Italian restaurant, my personal favourite) and Izumi (fresh Sushi) for $55 per person (saving over 20% from the individual prices) or for the food connoisseur the ‘Chef’s Table’ dining package allows you to dine at the three restaurants above as well as the Chefs Table which is a new wine and food pairing experience on board, the cost of this is currently $115 per person (saving you $25 per person. 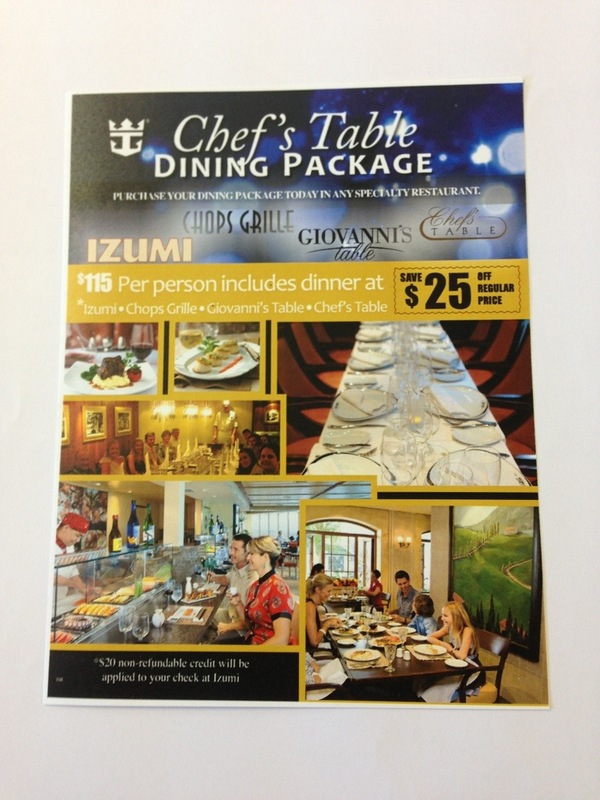 For those guests who have experienced Brilliance of the Seas Portofinos has been replaced by Giovanni’s Table. Complimentary dining options on board Brilliance of the Seas include the main formal restaurant which is open for Breakfast, most Lunches and Dinner with a choice of fixed dining times or ‘My Time’ dining which allows guests to choose when they want to dine in a special area of the restaurant (guests must pre pay gratuities for My Time dining option). The Windjammer Cafe is the casual dining option onboard offering traditional and international cuisine and is open for Early Breakfast, Breakfast, lunch, Afternoon snacks and Dinner, this is a fabulous alternative for evenings when you want to chill and enjoy the night at your own pace. The Park Cafe is new and is situated near the solarium, the Park Cafe allows guests to enjoy Fresh made to order sandwiches and paninis as well as soups, salads and pastries, the Park Cafe is open during the day and evening. If these options weren’t enough you still have the SeaView Cafe and complimentary room service, so let’s face it you will not go hungry. You can see the influence of the Oasis Class ships in the new dining options with the additions of The Park Cafe, Rita’s Cantina, Izumi and Giovanni’s Table. Hi, I’m Jill and am contributing to Anth’s Blog. Helen and myself from the reservations team were delighted to have the opportunity of experiencing the newly revitalised Brilliance of the Seas. 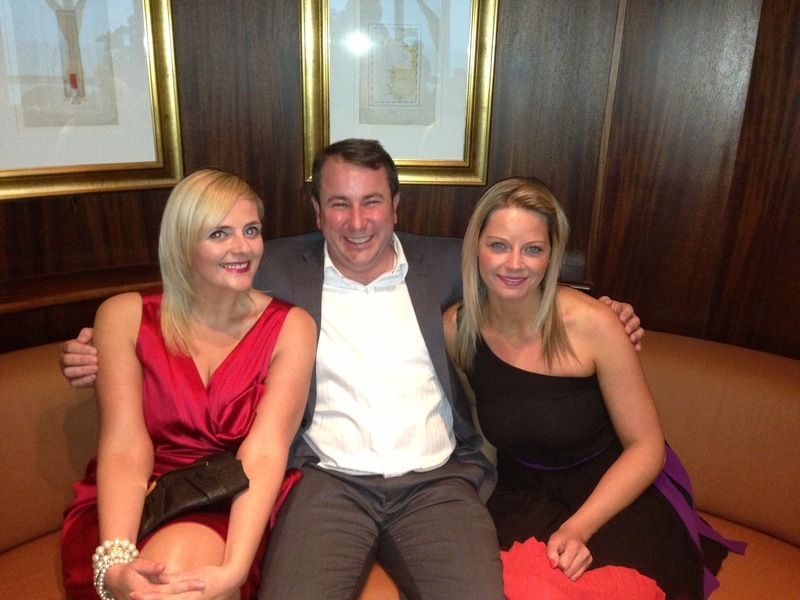 Below is a quick pic of the three of us in my favourite bar the Schooner Bar before dinner, I am the lady in red and I am with Anthony Cruise365’s owner and Helen who has worked at Cruise365 for eleven years. 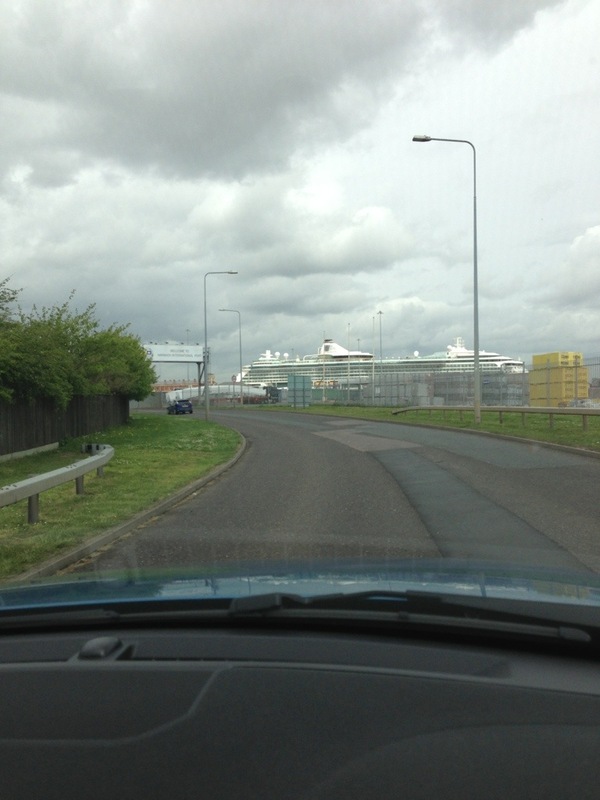 I am a Newbie to Royal Caribbean and I thought to myself whilst walking through Port of Harwich, would I get on and experience that ‘WOW’. I wasn’t to be disappointed, I walked onto the ship and was greeted with the magnificent view of the, aptly named, WOW Centrum. By day it is the hub of social interaction, i.e. people enjoying a glass of fizzy Champagne celebrating the beginning of their holiday at ‘Vintages’ and by night the Centrum is transformed to house Jaw dropping aerial entertainment… My stomach got butterflies thinking of all those fantastic trapeze performers dangling so high in the air! The WOW Centrum is certainly the pulsing heart of Brilliance if the Seas and you can’t help but be in awe from the moment you see it! 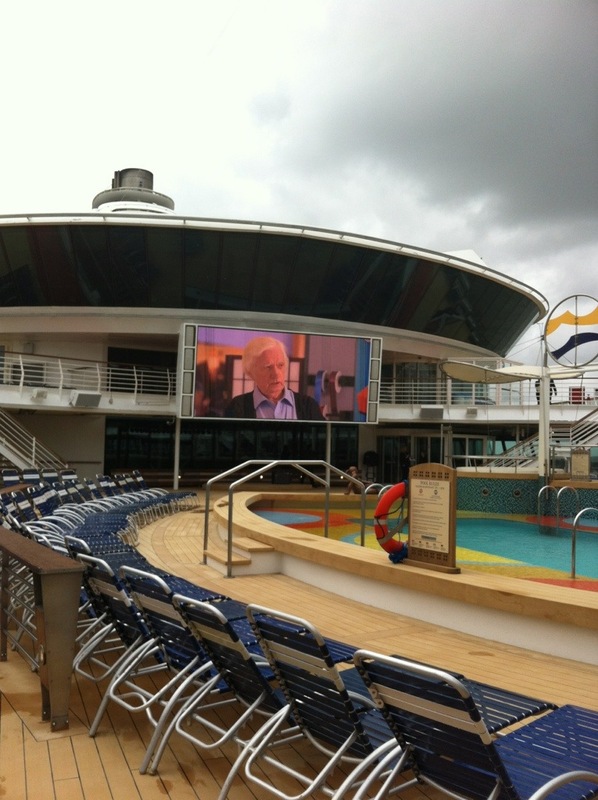 We dropped off our bags then started exploring Brilliance of the Seas revitalised features. 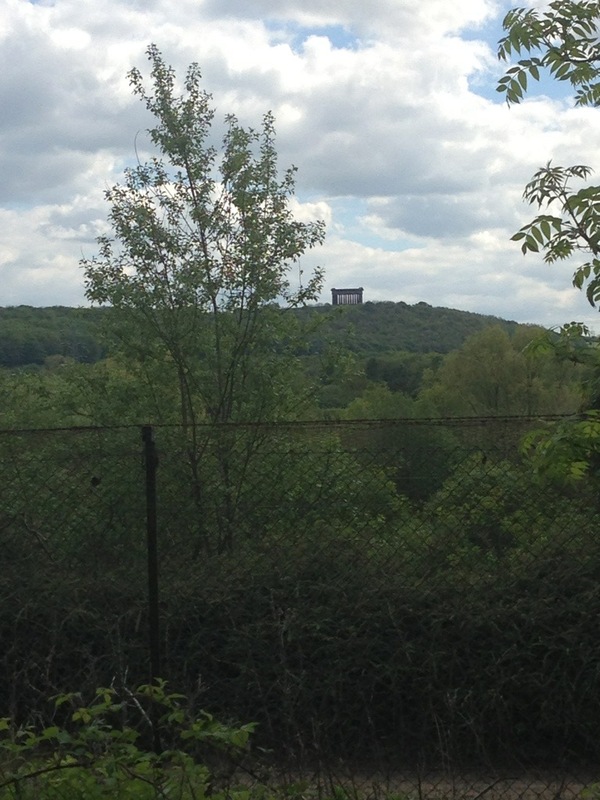 We decided we would start at the top, whilst weather permitted, and visited the 220ft Outdoor Movie screen. This is going to screen all major sporting events and latest movies so you don’t even have to move from your sun loungers. They have used the same technology that has been used in Wembley Stadium so you don’t miss one snippet of the action due to any picture quality issues…. And if it was a cooler evening, they will even provide you with cosy blankets so you can snuggle up under the stars with your loved ones and take in a movie! I have just had the pleasure of speaking to Lesley Green from the Crown and Anchor society in the new Diamond Lounge on board Brilliance of the Seas. The Diamond Lounge is for guests who are members of Royal Caribbean’s Crown and Anchor society who have achieved the minimum of Diamond Status. For guests who are unfamiliar with the concept of Crown and Anchor and Diamond status this basically means that when you have cruised 80 nights or more in staterooms from interior to balcony grades you receive Diamond status that allows you access into a members only lounge that gives you a complimentary drinks reception between approx 1700 and 2000 every evening onboard ship. The Diamond Lounge is also open for continental breakfast and I have always enjoyed a quiet latte or espresso in the afternoon. There are subtle differences on ships and by creating a ‘closed’ Diamond Lounge on Brilliance of the Seas’ Diamond or above members will enjoy complimentary wine, beer and selected spirits. There are a few Royal Caribbean ships that are awaiting revitalisation and do not have a Diamond Lounge, these ships have a Diamond Event every evening (usually in the Viking Crown Lounge) where guests receive complimentary wine plus discounts on beer and spirits. Guests who stay in Grand Suites or above or guests who have achieved Diamond plus status can use the Concierge Lounge (for guests used to the lounge on Brilliance of the Seas please note this has moved to deck 13 in the Viking Crown area). Diamond plus status starts I believe after 175 cruise nights. Other benefits of being a Diamond member include receiving an additional discount on Balcony or above staterooms on the majority of price codes (this depends on when you book and the duration of the cruise as you receive a larger discount if you book at least 6 months prior to travel). If you wish to accelerate your points so you achieve Diamond Status quicker then the easiest way is to book a Junior Suite or above as this will double your points so for example if you have cruises 58 nights and you book a 14 night cruise on board in a Junior Suite you will receive 28 points making your total cruise nights 86 nights giving you Diamond Status. Welcome to Harwich, after a 2 hour drive from Peterborough where Jill, Helen and myself stayed last night we are now overlooking the Port of Harwich. For those unfamiliar with Harwich the port is ideal for cruises to Scandinavia as it is situated on the East Coast of England in Essex. Harwich is handy for guests who live on the East Coast and my usual description to friends is drive south to Peterborough, turn left on the a14 and keep going to Ipswich and turn right, keep going until you see a big ship. Parking at Harwich is right at the port and a shuttle bus takes a couple of minutes to get you to the check in area. There are convenient rail connections from London Liverpool Street to Harwich which take just over an hour, the most convenient airport is Stansted which is just over 30 minutes a way by car.